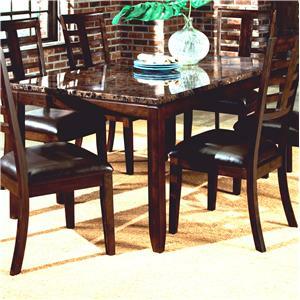 Dine in casual and contemporary comfort with this dining table. Featuring a dark cappuccino finish, it has tapered legs and clean lines for a versatile addition to your decor. 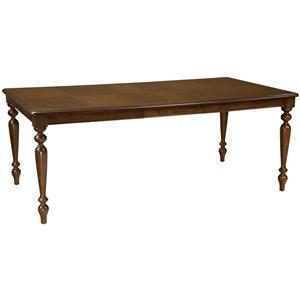 The Dalila Casual Dining Table with Tapered Legs by Coaster at Carolina Direct in the Greenville, Spartanburg, Anderson, Upstate, Simpsonville, Clemson, SC area. Product availability may vary. Contact us for the most current availability on this product. 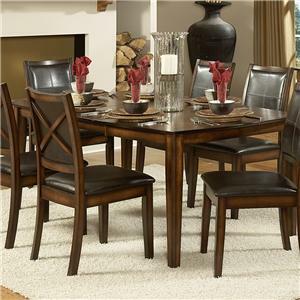 Dine in casual and contemporary comfort with this dining collection. 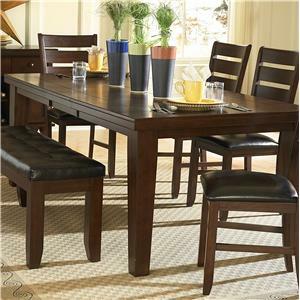 Featuring a dark cappuccino finish, this table and chair ensemble brings a focal point to your dining space with its presence. Gather around and take a seat in the slat back upholstered dining side chair. The faux leather upholstered seats add comfort and make cleaning up little messes easy. There's room for two at the upholstered dining bench. Dining benches are a comfortable option for dinner guests young and old and allows you to easily accommodate even more guests for special occasions or large gatherings. Store extra utensils and bottles of wine in the matching server, so that you don't have to leave the fun. The Dalila collection is a great option if you are looking for Transitional Casual furniture in the Greenville, Spartanburg, Anderson, Upstate, Simpsonville, Clemson, SC area. Browse other items in the Dalila collection from Carolina Direct in the Greenville, Spartanburg, Anderson, Upstate, Simpsonville, Clemson, SC area.